Returning to Battle School: Ender’s Game Movie Review (Spoiler free!) and Impression. 28 years since the arguably hit novel was released and captured the minds of an untold number of children and adults alike, Ender’s Game is finally hitting the silver screen. For some, this is a celebration of a beloved novel being realized into a new medium, for others their first foray into the future war for Earth’s survival. But how does it stack up? Is it as good as the book? Better? Worse? Is it a blemish on the beloved series’ now impressive mythos? I’m here to give you my thoughts on all of it, as spoiler free as possible. The first thing you should know if you’ve read the book, that this is not the Ender’s Game you knew. It’s close, much closer than we could have hoped to expect, but there are quite a few big differences, and with good reason. You’ll see certain characters before you would have in the book, some plots are slightly altered, some interactions are added or changed, and one fairly important subplot is simply dropped in favor of a shorter run time (and the fact that any sequels are unlikely, and would be different from the sequel books anyways.) But this is all due to the fact that the book is in truth, “unfilmable”. The way it is written, how so many things play out, even how Battle School is set up, would be either impossible to realize on the screen, or be so cost prohibitive that it’d push the budget into obscene territory. So if you’re looking for a literal book to movie translation, skip the movie, you’re going to hate it. However, Card was involved in the initial stages, helping in the process of keeping the movie true to the books theme’s and feel, and it shows. 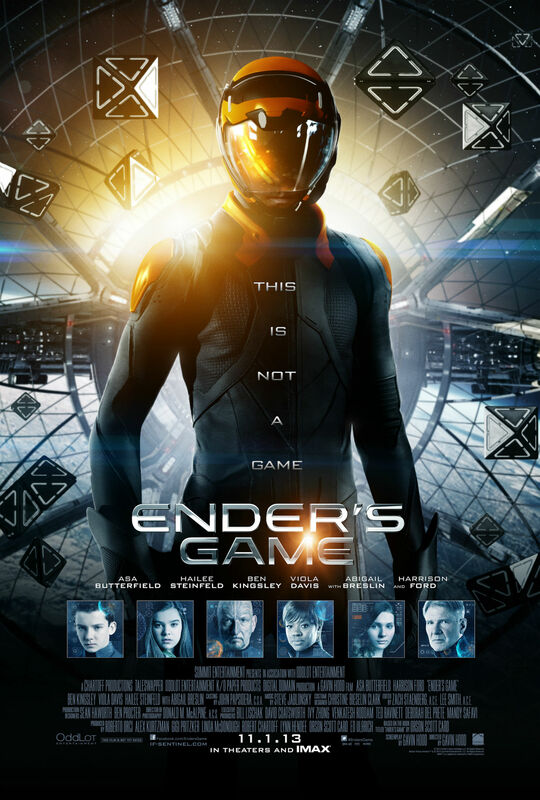 The overall tone, feel, and look of the movie is the Ender’s Game we all read. Asa Butterfield truly brings Ender to life with his portrayal, and Harrison Ford does a great job with Graff, giving him the feel of a man desperate to save humanity. Battle school is well designed, a great translation from book to movie, and even the mind game makes it’s much needed appearance, though not exactly as we remember, albeit in a way that is better suited to the movie’s pacing and changes. If you can get past the fact that the movie isn’t exactly what the book was, you’re more than likely going to love it. It manages to build up tension well, in all the right places, keep you caring about Ender and the war, all while showing a side of humanity that we try and downplay greatly in all of our forms of entertainment. There is a scene between Graff and Ender that isn’t in the book, but that is simply chilling, not only pointing out a major theme of the movie and book, but calling out the trait in humanity itself, which I feel truly defines the movie into it’s own beast. This is easily one of my favorite scenes of the movie, and it is where Asa Butterfield and Harrison Ford really show how perfect they were for their roles, and how powerful this adaptation is. But don’t feel like you can’t see the movie if you haven’t read the book or can’t remember any of it other than it involved some kids, aliens, and a weird room. The movie explains everything you need to know that’s important (It does skip out explaining why Ender refers to himself as a “Third” at one point, being an authorized third born child in a society that only allows 2 to control population growth, however this is only touched upon in the beginning and then left alone, so it’s not crucial to understanding the movie. ), and the plot is self contained, meaning you can enter the movie with no prior knowledge, and leave having a full experience, with the option to have more by reading the books. Command School is simply gorgeous all around, especially the battle simulations. While the special effects are impressive throughout the whole movie, this is where they truly shine, and this is where the tension runs highest in the movie. Everything is handled spectacularly, yes, even that part readers of the book are worried about, and despite knowing in advance the plot, it’s going to blow you away. I went to an opening night IMAX showing with my girlfriend, who had never read the book, and we were both equally impressed, and she’s not a big sci-fi/action fan. She couldn’t help but get caught up in the plot, and caring about Ender’s journey. We spent the entire car ride home talking about the movie and what we liked about it. Based on the best-selling, award winning novel, Ender’s Game is an epic sci-fi adventure which stars Asa Butterfield, Hailee Steinfeld, Ben Kingsley, Viola Davis, with Abigail Breslin and Harrison Ford. The film was first released in Germany on October 24, 2013, followed by the United Kingdom and Ireland on October 25th, 2013. It was released in the United States, Canada, and India on November 1, 2013, and will be released in additional countries through January 2014. It is rated PG-13, and has a run time of 1hr 54mins.